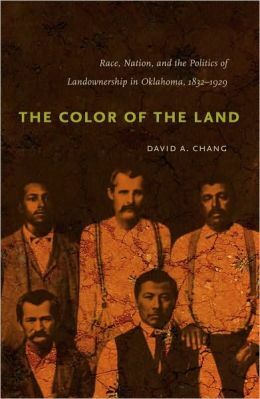 The Color of the Land brings the histories of Creek Indians, African Americans, and whites in Oklahoma together into one story that explores the way races and nations were made and remade in conflicts over who would own land, who would farm it, and who would rule it. This story disrupts expected narratives of the American past, revealing how identities–race, nation, and class–took new forms in struggles over the creation of different systems of property. Conflicts were unleashed by a series of sweeping changes: the forced “removal” of the Creeks from their homeland to Oklahoma in the 1830s, the transformation of the Creeks’ enslaved black population into landed black Creek citizens after the Civil War, the imposition of statehood and private landownership at the turn of the twentieth century, and the entrenchment of a sharecropping economy and white supremacy in the following decades. In struggles over land, wealth, and power, Oklahomans actively defined and redefined what it meant to be Native American, African American, or white. By telling this story, David Chang contributes to the history of racial construction and nationalism as well as to southern, western, and Native American history. This entry was posted in Books and tagged african americans, land ownership, oklahoma. Bookmark the permalink.